There are 13 Assisted Living Facilities in the Staten Island area, with 8 in Staten Island and 5 nearby. The average cost of assisted living in Staten Island is $6,080 per month. This is higher than the national median of $3,346. To help you with your search, browse the 63 reviews below for assisted living facilities in Staten Island. On average, consumers rate assisted living in Staten Island 3.8 out of 5 stars. Better rated regions include Elizabeth with an average rating of 4.4 out of 5 stars. Caring.com has helped thousands of families find high-quality senior care. To speak with one of our Family Advisors about assisted living options and costs in Staten Island, call (855) 863-8283. Staten Island, New York is the southernmost borough of New York City and is accessible from Brooklyn via the Verrazano-Narrows Bridge. Staten Island is home to New York City's largest forest preserve, Staten Island Greenbelt, and is consequently an appealing option for seniors looking to live in the City but also maintain proximity to nature. Assisted living facilities in Staten Island, like the rest of the state of New York, are called adult care facilities (ACF) and provide long-term residential services to adults who cannot live on their own for various reasons. The New York State Department of Health licenses ACFs across the state, and there are 8 ACFs directly in Staten Island for seniors to pick from. There are an additional 61 facilities nearby. Though Staten Island maintains Metropolitan Transportation Authority (MTA) bus lines and transit lines, seniors should be aware that it is the only borough that is not directly connected to the Subway system. Instead, the free Staten Island Ferry provides access to Manhattan across New York Harbor. The Staten Island area is home to world-class medical facilities, including the Richmond University Medical Center and the Staten Island University Hospital, in the event of medical emergencies or illness. Compared to other boroughs in New York City, Staten Island offers a cheaper overall cost of living. For example, Manhattan is 74 percent more expensive than Staten Island. Seniors seeking affordability in New York City could consider Staten Island. Staten Island provides seniors with easy access to many cultural attractions, including Ellis Island and the Statue of Liberty. Citizens aged 62 and up can enjoy discounts to both of these historic landmarks. Staten Island has an array of community resources for seniors, including the Marina Senior Center, an organization that offers socialization through shopping, meals and exercise or art classes, as well as five other senior centers. New York City has one of the highest rates for ozone pollution in the country, and Staten Island received an F grade for its ozone caliber. Additionally, Staten Island experiences the highest levels of smog between the city's five boroughs. Seniors who deal with chronic respiratory illnesses should be aware of the poor air quality in Staten Island. Assisted Living costs in Staten Island start around $6,080 per month on average, while the nationwide average cost of assisted living is $4,000 per month, according to the latest figures from Genworth’s Cost of Care Survey. It’s important to note that assisted living rates in Staten Island and the surrounding suburbs can vary widely based on factors such as location, the level of care needed, apartment size and the types of amenities offered at each community. 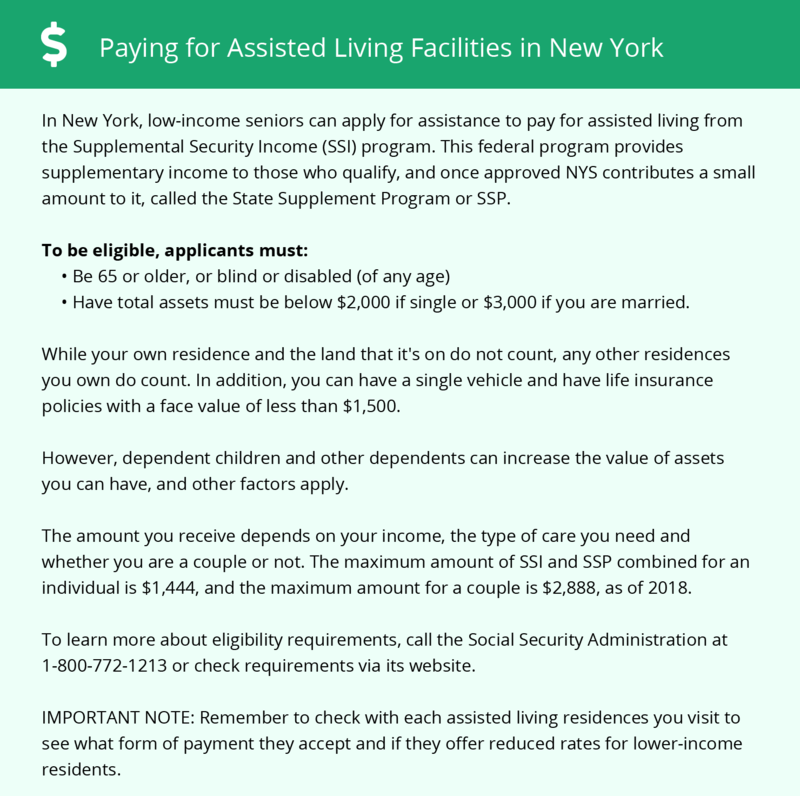 The Medicaid program's Assisted Living Program waiver provides monetary aid for seniors seeking assisted living in Staten Island, as well as the rest of the state of New York. Applicants can be private-paying or Medicaid recipients. To see a list of free assisted living resources in Staten Island, please visit our Assisted Living in New York page. Staten Island-area assisted living communities must adhere to the comprehensive set of state laws and regulations that all assisted living communities in New York are required to follow. Visit our Assisted Living in New York page for more information about these laws.